What is the Top Balance Bike for 2 Year Olds & Up? What are the features of a balance bike? What’s the difference between a balance bike and a tricycle? What age should my child be before learning to ride? How do you choose the best rated balance bike? Even in the modern times when most kids like to sit at home and play games (even the youngest ones!) it’s very hard to find anyone that doesn’t enjoy riding the best balance bike! It’s a wonderful idea to inspire the young ones and have them be introduced to the world of fresh air and enticing turning wheels. It can be hard to look at all the options of balance bikes for kids available out there since there are many brands that are trying to make the most appealing design and build for kids. Much like a 3-wheel scooter for kids, they help to support the athletic growth of your child, helping them to learn to balance. Whether your child is 2 or 8 years old, it’s never too late to introduce a balance bike into their daily life. It can help with encouraging independence and can also be a fun option if the child doesn’t like walking and still wants to be involved in family walks and activities. Whichever way you look at it, it will definitely be a useful skill later on in life and can provide lots of family time as the child attempts to learn! To help in choosing a suitable balance bike for your little one, we put together a list of ten products that in our opinion currently rule the market. We also included a series of answered question that many parents have before sending off their toddlers and kids off on their bicycle adventures! Looking for ride on toys for your toddler? See our review of the best kids ride-on toys here. KaZAM’s balance bike is the place to start when looking for new bicycle options for your kids. This product is the same exact same one that has been featured and accepted on Shark Tank, this bike has been on the market for close to a decade and has earned itself a spot in the Top 5 of Amazon’s list for kids’ balance bikes. This product will help your child to walk, glide and eventually balance at their own pace and comfort while avoiding dangerous falls and injured knees. More than 95% of the customers who purchased this bike for the kids in the family has experienced the children learn to properly balance and glide within weeks to months. People have stated that it’s a get transportation tool, especially for the times when longer walks or trips have to be made. This bike comes in four very lively, friendly looking pastel colors: light blue, bright green, orange, pink and red. You will definitely find a safe color option to pick from within this vast selection. The star feature of this product is actually the footrest that is positioned in a natural position on the bike that the child can rest their feet on when gliding and riding. This addition encourages kids to find their center of gravity quickly. Why We Liked It -This bicycle is available for kids up to 5 years of age and you can rest assured that you child will be gliding with KaZAM in no time! The footrest that encourages the child to find their own center of gravity is the key element for this product, and it has proved to work with hundreds of kids across the globe successfully! Cruzee is one of the best choices when it comes to balance bikes! Not only do they have a color selection of more than 20 colors to satisfy even the fussiest of kids, but they have made the bike in a way that the kids can unpack and assemble it themselves under the supervision of an adult. The bike is very easy to put together and will help the children feel independent by allowing them to do so, encouraging a sense of achievement before even getting to sit on the bike. It’s available for kids in the age range of 1.5-5 years and has an adjustable seat and handlebars to help customize it to your child’s size and posture easily. Upon placing in the purchase you will also get a lifetime warranty to make sure your child will get the best use of this bike! The adjustable features mentioned before ensure that the balance bike can grow with your child and can serve for up to 3 years! Cruzee prides themselves for having the lightest balance bike in the world, too. This helps your child get easy control of the bicycle and if an accident happens, they bike only weighs 4.4lbs and should not inflict any damage! Why We Liked It – Cruzee is a great example of a product that supplies the customer with many great options, from the incredible pool of color variations to adjusting the seat and handlebars to grow with your child over the years. If you decide to pick Cruzee’s balance bike, you can be sure you’re picking one of the leading products! CriticalCycle’s is able to impress nearly everyone from the get-go, the key feature of their balancing bikes is the fact that they use very child-friendly, two-color variations of pastel colors. They are very pleasing to look at and should encourage any child to go and try it out! It’s available in six color variations: a powder blue and light pastel yellow, simple black, orange and blue, blue, lavender and white and pink.It’s easy to see that choosing a bike for your child from this wide selection should be intuitive and easy! CriticalCycle’s balancing bicycle will help your kid get the best out of riding, it will help generate confidence and balance before adding pedals which will decrease the amount of accidents and injuries that could occur. Above all, this balance bike is very comfortable to sit on and has soft grips to help the child take control of their rides. The wheels are tough and will not be punctured nor run out of air which ensures that your child will get months and even years of fun rides! It’s available to be used by kids aged between 18 months to 5 years. The assembly is quick and painless and you will have a happy little one cruising around the house and outdoors within minutes. Why We Liked It – CriticalCycles is ready to impress with their vintage variation of colors and don’t disappoint with the wonderful craftsmanship of the bike itself. This balance bike is designed in a way to reduce injuries and has air-free tires to make sure that you won’t have to fuss around with pumps or have the wheels be punctured! If you are looking for a safe and appealing balance bicycle for your child, this is one of the best choices. Chicco’s balancing bike is the perfect gift that a child could ask for! It will help the young one feel included in family activities that may include bikes or long-distance walking. This little bike will help your child learn how to balance on their own over weeks and months of fun rides that will feel more like entertainment that training. Without even knowing it, your child will have already subconsciously learned how to keep their balance without pedals at hand- this will keep the experience safe and injury-free. The tires are soft and sturdy and don’t need any pumping since they don’t have any air within. The frame will meet the ergonomic needs of the spine while still being adjustable and light-weight. If your child ends up falling off, the bike shouldn’t cause any serious injury since it is very light-weight to help co-ordination and keep the learning environment safe. The way the bike is built, Chicco recommends it for kids 3 years and older. Chicco’s bike is very affordable and is the perfect solution for parents or relatives that want to gift their child a balance bike to help encourage riding but don’t have hundreds of dollars to spend! Being in the Top 5 of Amazon’s balancing bikes, it’s easy to see why there are so many five-star reviews given to this product! Why We Liked It – Chiccos allows parents and relatives around the world to purchase a quality balance bike for their kids without charging them hundreds of dollars. It’s great to see a brand take care of their customers as well as Chicco does while still being able to maintain a very safe and well-crafted product. If your little one is a bit more sporty and wants to have a balance bike that reflects their enthusiasm for sport, Strider’s balancing bike will prove to be the best choice. The bike is designed in a way to reflect a feeling of speed and racing and should inspire any active toddler to get on and start riding. The balance bike comes in various colors: black, blue, red, orange, pink, red and yellow. No matter what color your little ones likes most, they will be sure to find something for themselves within this selection! Strider will encourage your child to learn to ride through a balance bike thanks to its simple and inviting design. A balance bike is the first step in learning how to properly ride a bigger bike with pedals without getting injured along the way. The bike itself weighs only 6.7 pounds which makes it ideal for striding and riding along, it will make sure your child doesn’t get too exhausted during their practice. Since kids can be unpredictable and like taking their bikes through very rough terrains and exposing them to general tough love. The durable steel frame and puncture-resistant tires will allow you to let your child have all the fun they like without worrying about keeping up the maintenance of the balance bike! Why We Liked It – The Strider balancing bike is designed to be both educational and safe. This is one of the best bikes when it comes to having a durable product that also looks appealing and inviting to the child while providing hours of fun among all sorts of terrains. If you are looking for an inexpensive and durable product, Strider’s balance bike is the best choice! Joovy has taken it upon themselves to produce a very appealing and modern looking balance bikes to help your child feel both confident and safe while staying away from typical children’s patterns, you will be able to help your little one feel more grown up already! Joovy’s balance bike comes in two color variations: simple, all around black and white with black and red tires. Both designs look very fashionable and should help your child be excited about riding out and practicing their balance every day on their new balancing bike! The tires are refillable and are 2.25” wide to help encourage stability while cruising. The seat is adjustable to the exact height of your child for maximum comfort and the heavy-duty aluminum frame will make sure that your child feels stable, sturdy and protected when riding. The frame is not heavy as to prevent any damaging injuries should the child fall down and the bike on top of them. Thanks to this light-weight design this balancing bike is much easier to control than its other, heavier alternatives. The wheels on this bike have a superior suspension to help your child get a smooth ride through all the terrains they will take the bike through. Why We Liked It – Joovy makes sure to stand out from other competitors in the balance bike market because they decided to use rubber tires instead of the EVA plastic tires common in the industry today. Thanks to using rubber tires Joovy’s bikes wear out way slower and are some of the best endurance-wise. If you have kids over the age of five that still haven’t had a chance to get to know a bike properly, GlideBikes has made it their goal to help them achieve their bicycle riding dreams. This means that this glider bike is a bit more advanced since it’s for older age groups. The tires are made from rubber and are air filled to ensure a smooth riding experience. There is also a patented slow speed design to make sure your child doesn’t get into any accidents by going too fast. GlideBikes’ bike also has removable foot pegs and a footrest. If your child quickly learns to balance on their new balancing bicycle and needs a new challenge, you can attach the pedals and let them experience the full extent of the product you bought (pedal equipment sold separately). This slow speed bike will help raise your child’s confidence in the weeks and months that it will be used and when changing to the pedal alternative the change should be very easy to adjust to and almost unnoticeable. The bike also has child-sized handbrakes to help the child learn early on the safety measure of riding a bike outside- this will make it much easier to control the bike with pedals later on since the child will already have engraved the safety habits as muscle memory. Why We Liked It – This is the best balancing bike for older kids aged from 5-10 years, it can grow with the child thanks to the adjustable options. All the features available when purchasing this balancing bike will help the child feel more grown up and have a sense of achievement when they will be ready to have the pedals installed! BananaBike is ready to grab the customer’s attention from the get-go; their friendly and fun brand name should attract any parent who is looking for a kid-friendly balancing bike. You can often catch this product at great prices (sometimes even up to 22% off). it looks great and is best for 2,3 and 4 year olds who have never ridden before and are eager to learn how to balance so that they can move on to pedal bicycles! The colors available for purchase are: blue, green and pink. BananaBike also regularly improves their products to help make them better for their customers. This means that this bike, updated in 2019, has some new and improved features, too. Like the upgraded seat, stronger metal headset, upgraded handlebars and an easier design to help encourage kids to assemble the bike themselves. Thanks to the light build, it’s very easy to carry by parents or older kids and has puncture proof EVA tires that can endure all kinds of abuse that they will be exposed to during rides. You will never have to inflate them and can be sure your child will be able to have healthy outdoor fun without sustaining any injuries. It’s easily the most affordable balance bike out on the market and will be the best gift for any family with more the one child since you can easily buy two for the price of one! Why We Liked It – BananaBikes has a great design that is meant to resemble an actual banana to encourage the kids to view this balance bike as a fun accessory to learning to balance. This bike has one of the best prices out there and is perfect for families who would like to buy one for more than one child. The constantly updated design makes sure you will only get the updated bicycle each time with the best features! TeddyShake has been able to help hundreds of kids across the world to gain confidence when getting on a bike for the first time. The simple design will allow your child to set up this balancing bike on their own, specifically since there are only 5 pieces to put together. This can help the child feel like they had a say in putting together this bike and can feel more attached and excited to try it out. TeddyShake claims that this simple balance bicycle can be set up in as little as 4 minutes! The steering is easy and intuitive and shouldn’t pose any trouble to the child when riding and can be used by kids that are as young as 24 months. It comes with a 3 year warranty, which is exactly the amount of time that your child should be using it for before they grow out of it. TeddyShake is sure that their customers will love this bike and are ready to keep it as safe and accident-free as possible. 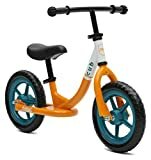 This balance bike is extremely light and the tires don’t need to be filled with air, this means that you won’t have to focus on maintaining the bicycle. Also, instead of having to revamp the whole balancing bike when you want to adjust it to your child’s height as they grow, you can easily just use the quick-clamp technology and adjust it within seconds. Why We Liked It – TeddyShake allows even the youngest enthusiastic toddlers to try out their luck at maintaining their balance on a balance bike. With this balance bike, it will be extremely easy for your child to explore the run of riding and learning to ride a bike. TeddyShake provides us with one of the best products in the bicycle category, simply because it’s the perfect starting point! Janod’s balance bike is sure to attract every child that sets their eyes upon it- the very playful and toy-looking design should encourage any child to hop on and try their luck. This bike has inflatable rubber tires that are some of the most durable alternatives on the market. Most balancing bikes use tires that are not able to be punctured or are not able to be inflated, but sometimes it’s better to get the child familiar with the real mechanics of a real bike while using inflatable tires. It has a wide age range which is from 3 to 6 years old and should help your child develop their skills in those three years so that later they can immediately switch to a real bike with pedals and avoid any serious accidents or injuries. The design is made from wood instead of steel and this is one of the other features that make this bike very accessible for kids- it’s not heavy and it it ends up falling on your child it shouldn’t have much impact. This balancing bike looks very playful but despite that it still has a very robust and fine finish that will keep your child safe when riding around. Why We Liked It – TeddyShake is one of the only brands out there that has made a balance bike that looks so playful and inviting even for the youngest of kids. There should be no problem in encouraging and getting your child to start training their skills with this bike. It’s the most intuitively designed product on the list when it comes to appealing to children! It’s a bicycle that has been created to be a safe alternative to tricycles and bikes with training wheels. They are usually meant for younger kids, but you can buy them for various age groups (12 months- 3 years/ 3 years- 6 years/ 6 years- 10 years). These bicycles don’t include any pedals or training wheels, they strip the common bicycle design to the bare minimum to help the child learn to balance first instead of them having to focus on pedals, brakes and balancing at the same time. The handlebars and seats are usually adjustable too so that the bike can grow with your child over a period of time. It will have them get used to balancing and riding before moving on to focusing on pedals and brakes. It is also common for these types of bikes to have footrests in the middle of the bike to help the children discover the concept of balance and help them keep their feet in a safe place when gliding. Usually, kids are expected to focus on maintaining balance, peddling and operating the breaks at the same time. This can be a very tough task for a young three year old and can cause many injuries in the process due to the learning curves. When trying to jump in like that, the end result is usually crying, scraped knees and bruises. This can discourage the child heavily from trying to bicycle again because they associate it with pain and humiliation. For more benefits of cycling, read the study. When giving your child a balancing bike however, they are able to cruise and glide along while having no pedals and letting their feet have full control of the speed. This will build confidence and switching to a bicycle with pedals later on should be no problem, since the child will have already learned to control the bicycle and the balance principles. Tricyles are bicycles for kids that have one wheel at the front, two at the back, brakes and pedals. This kind of bike usually builds too many comfort zones and leaves your child relying on gliding while already having the balance settled by the third wheel instead of using their bodies. This also means that your child will get so confident that they will never want to try out a real bicycle since their comfort zone lies within the third wheel, where they don’t have to put in any effort. In contrast, balancing bikes will have your child rely on using the feet to cruise along instead of an extra wheel. This will be training their balancing since they will have to know which was to lean when gliding. This will gradually build up your child’s confidence and help them feel a sense of accomplishment every time they get it right. This is something that won’t happen with tricycles, since they give you full comfort from the get-go. It really depends on the child; some kids can be put on a bike as young as 12 months and do fine by just learning to cruise and glide, while some other kids can’t reach the ground at that age and have trouble coordinating their legs accordingly. Usually the average age to put your child on a balance bike is 24 months, although some specialized balance bikes for very young kids may also be an option! Kids can be fussy, and it’s good to know exactly what color and design your child would like before settling on a final purchase! There are sometimes dozens of designs and patterns to choose from even for just one product. There are also many options to choose from: whether you would like air-free or inflatable tires, brakes or no brakes, steel or wooden frame. All this is important since each age group will need something different and suitable just for them. For example, maybe older kids are able to take care of heavier, steel framed bikes properly and won’t get in too many accidents with them. This will help them to find more balance since the bike is heavier. Younger kids however may fall over a lot as they try and find their way and therefore maybe wooden or lightly made aluminium bikes would be better for them.It’s also good to measure your child and estimate what kind of bike would be ideal for them. Some kids are exceptionally small or big for their age, and this will impact the bike that they will feel most comfortable on. Also make sure that they understand the concept of a balancing bike and that they know how to use it safely! Our Top Choice spot has to go to KaZAM’s balance bike! It’s one of the most sought after bicycles after its exposure on Shark Tank and it has helped many kids around the world to gain both confidence and balance. Not only is it also featured in the Top 5 products of its category, but it has won awards too. The well-positioned footrest will help your child get the most out of their first bicycle riding experience. The frame of the bicycle itself is designed in a way to help ergonomically support your child and let them have proper feet placement and balance. The tired are puncture resistant and will never need air which will help your child experience more rocky and rough terrains without worrying if the balancing bike can sustain it! The bicycle has adjustable handles and seat to to encourage your child to ride and explore throughout their development and growth. KaZAM has impressed nearly every customer that has come across their product, and we hope they will never cease to do so. Thanks to all the safety features, color variations and adjustable options, KaZAM’s balance bike has easily taken the Top Choice spot on our list! Our Premium Choice spot goes to none other than Cruzee! Their balance bike has given customers some of the vastest options when it comes to customization of their kids’ bikes. There are 20 colors to choose from upon purchase and Cruzee provides you with a lifetime warranty over this seemingly simple bicycle. Thanks to Cruzee also making their product one of the lightest balance bikes in the world, you can rest assured that your child won’t be seriously injured if they trip over and the bikes falls on them. It’s a very light-weight frame that shouldn’t inflict any damage. If you or your child are not satisfied with the bike you can easily turn it back, get 100% of your money back without any fuss or trouble. No matter where you live or what terrain your house is surrounded by, this balance bike can withstand a lot of the environments that you put it in while still providing effortless rides for your child. It’s made of rust-free aluminium, therefore if there is no place in the house to leave the bike or if you get caught in the rain you will be able to leave it to dry without worry! Thanks to Cruzee’s initiative to make one of the world’s greatest balancing bikes, we have to give them the spot for the Premium Choice product. All of their features are useful and will help your child achieve confidence quicker, wherever they choose to ride. Our Great Value spot has to go to CriticalCycle’s product! They have taken their time to make their balance bikes stand out among the others in its category. The vintage design is very pleasing to look at and the double-color variations, from which there are six to choose from, will allow you to pick something that suits your child best. The seat and handlebars are soft and will not cause a discomfort for your child, either. They were made in a way to allow ergonomic support while still keeping the the pad soft and comfy to ensure your child can spend hours cruising! The air-free tires will save you any trouble of pumping air in or out or puncturing the wheels by accident during rocky rides. With an age range of 18 months to 5 years you can be assured that your child will have this balancing bike for at least 3 years and will cherish it as a fun memory to have grown up with! Thanks to CriticalCycle’s affordable price (which is nearly 50% less when compared to other bikes out on the market today) we are happy to say it got the spot as our Great Value product due to the useful features and appeal that it carries! It can be difficult to choose a balancing bike that suits your kids, grandkids, siblings or cousins. It can be a daunting task to scroll through pages of bicycles that are all listed as top-selling products and still having to choose one among the ocean of many. The stunning amount of color variations and features do not make it easier, either! We hope you were able to find something useful within this article, whether it be a new gift for your intended little one or some useful information! For more reasons why your toddler should have a balance bike click here. Even elementary schools are backing them up – see this study.